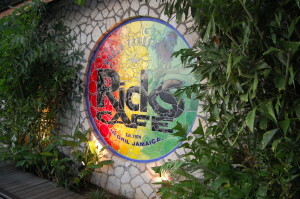 Visit Rick’s Cafe in Negril, Jamaica. No trip to Jamaica can be considered complete until you take an afternoon to catch a sunset at the World Famous Rick’s Cafe. Located down the far West End of Negril, perched along the cliffs, you’ll find Rick’s Cafe. People from all over the world come to see and experience a sunset here more than any other part of the island. The West End of Jamaica has some of the most spectacular sunsets in the world and it’s hard to argue with it once you come see and experience it for yourself. Ricks Cafe has been around since 1974 and has become a huge landmark of the island. You’ll see busload after busload of people heading down the West End road in the late afternoon hoping to make it to Rick’s to catch some of the most picturesque sunsets in all of the Caribbean. With an awesome island party atmosphere, great vibes, pumping Reggae music, friendly people and good food & drinks, it’s no wonder this place is the happening spot in late afternoon. Live Reggae music every sunset, extreme cliff jumping, lots of people dancing and partying it up and an overall exciting time easily makes this the place to be in Jamaica. 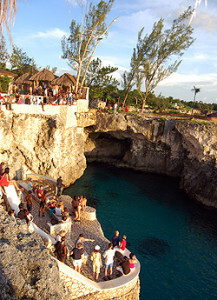 Cliff Jumping at Rick’s Cafe, Jamaica! Rick’s hosts a great food menu with excellent Jamaican dishes, fresh seafood specials, everyday island favorites and ice cold drinks from the bar. Come for lunch or dinner and have some of their delicious food, but stay for sunset as that’s when things get busy! The crowds flock to Rick’s just to capture the best picture during sunset when the sun melts into the cool Caribbean Sea. You’ll see some crazy extreme cliff jumping as divers take to the trees and climb as high as 75′ to make a splash into the waters below. Bring your swimsuit and a towel if you feel adventurous enough to try it yourself, along with a friend to capture it on camera. This place gets rocking everyday at sunset, so come experience it for yourself. Come for the food and drinks, stay for music and the sunset. Just remember, cliff jumping at Rick’s Cafe will be an experience and memory that you’ll never forget! They also host a Pool and Ocean Club area for day visitors where you can just relax and chill in one of their many pool cabanas with friends while lounging or swimming in their pool. Rick’s Cafe is a popular place and you’ll always find some fun going on no matter what your style or liking is. Dance, swim, cliff jump, eat, drink, relax and just chill. It’s no wonder this place is such a great hangout. Jamaican Sunsets are Great at Rick’s Cafe! 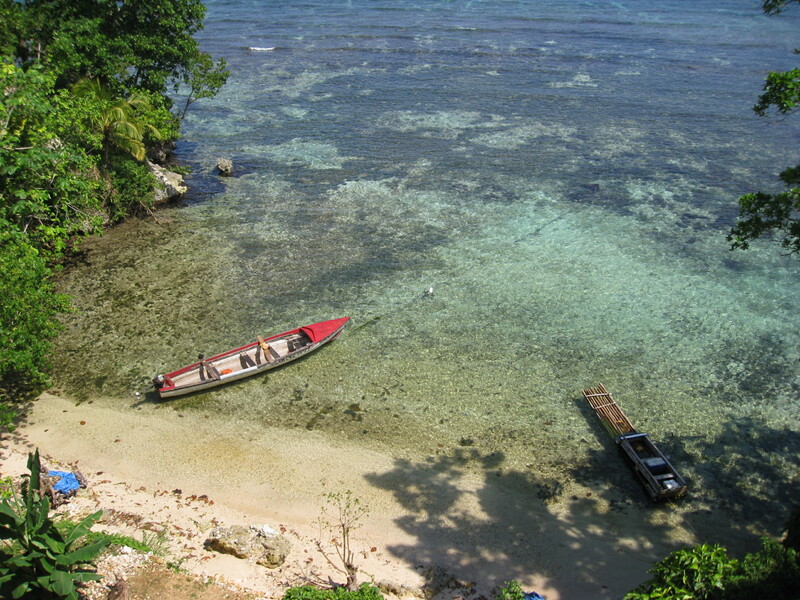 After a day of scuba diving Jamaica, head on over to the World Famous Rick’s Cafe and see what all the buzz is about. Get a drink, grab a seat and just chill out and relax. The excitement, the positive vibes and friendly atmosphere there is truly what makes it the most happening place on the island during sunset. Don’t take my word for it, go see and once you do, then you’ll know why! Be sure to bring some friends, or make some new ones while you’re there! Don’t forget your swimsuit if you feel daring enough to try cliff jumping yourself, like the Rick’s Cliff Divers. And most of all, don’t forget your camera! You’ll want to capture the moment you take that cliff jump and also for the sunset. Rick’s Cafe is very exciting, there’s always lots of fun going on with great drink and food specials and it’s simply a must-do while in Negril or Jamaica for that matter. 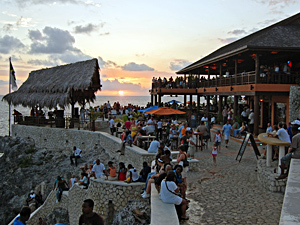 Come experience one of the most beautiful sunsets in all of Negril at Rick’s Cafe, Jamaica! Once You Go, Then You’ll Know! This entry was posted in Entertainment, Negril, Restaurants, Scuba Diving, Things To Do, Travel. Bookmark the permalink.